Phone Call us at any location during open hours. Staff usually monitors from 8 AM—4 PM (M-F). a few minutes When staff is available. Chat Chat live from work, school or home. No downloads. It's free. immediate When staff is online. for in-depth help with your research. Chat is offline. 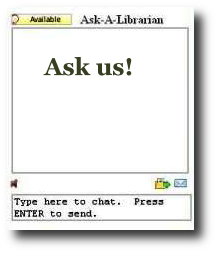 You can contact the librarian by email at library@alliant.edu and we'll answer it when possible. During open hours, you may also choose to just call us.